It doesn't happen very often, but every once in a while an author will reach out to me and ask if I'd like to review their book. I am still blown away by this fact. After I have recovered from the fainting spell I will inevitably have at these occurrences, I am usually filled with immense trepidation. What if I don't like it? What if it's just horrendous? What about the giant teetering pile of books I already have sitting in various locations around my house?? Do I even have time to bring in a book that has a person on the other end who is probably waiting for a review to be posted?? In other words, I am very careful about what books I accept to review. 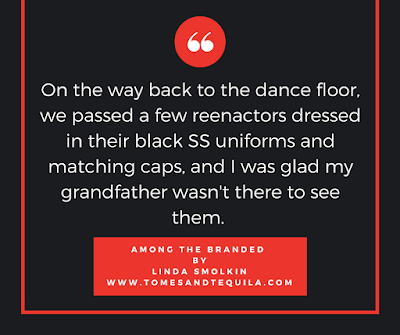 When Linda Smolkin wrote me to see if I'd be interested in her debut novel Among the Branded, I was first intrigued because she mentioned an ex-boyfriend and the worm in the bottom of a tequila bottle. (bonus points in my book) But I was really sold by the tiny blurb of a synopsis she put in the bottom of the e-mail. And I'm very happy I said yes to this book. 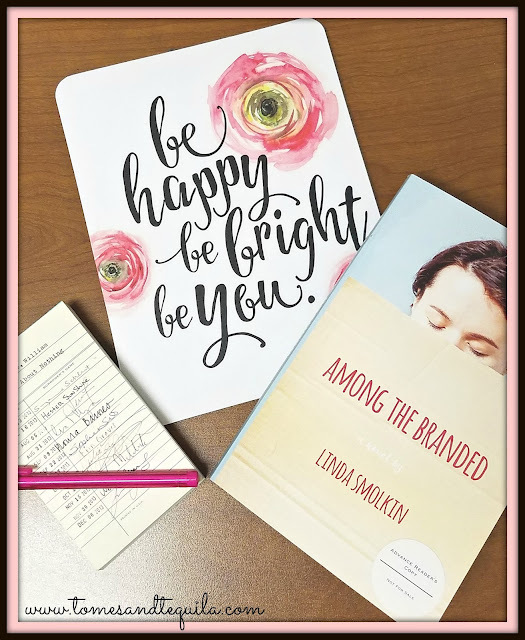 Among the Branded is a feel good novel with a conscience. Stephanie is an art director who decides to attend a "Valor of the 40's" event with her youngest son and husband after dropping her oldest son off at college. While there she buys a bundle of old love letters, thinking they'll help inspire her with the design of a new project for a client. One of the letters isn't like the others. It isn't a love letter at all, but a pleading letter for help from a camp in the South of France. 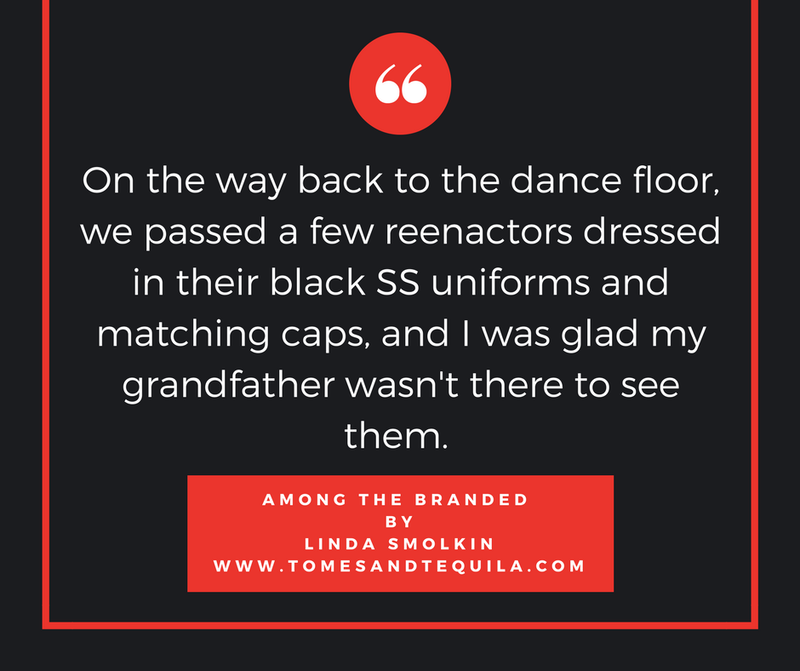 A Jewish family is headed for the concentration camps and desperate to get away. Intrigued, Stephanie has to find out if the family made it out alive. Her search leads her to Isadore...or Izzy to his friends. And soon it becomes much more than history or an abstract idea of what happened in the past. It becomes a present at odds with her beliefs, and she must decide what she's willing to give up to be happy with her own personal story. This book gave me warm and fuzzy feelings throughout. It wasn't shocking, and it didn't have any crazy-epic plot twists, but for me it was a warm cup of hot cocoa book. I just liked it. I thought it was very well written, and I fell in love with a few of the characters...namely Stephanie's best-friend Sveta and Izzy. Sveta, mumbling cuss words in Russian under her breath at work just cracked me up. And there wasn't much not to love about Izzy...the joke-cracking, video-game-playing professor. I think the book has a boat load of conversation fodder. In the novel the context is the Holocaust, but a big discussion throughout is whether you have a responsibility to tell your story, whatever it may be. And I think that's a great thought to ponder...do we all need to be advocates? 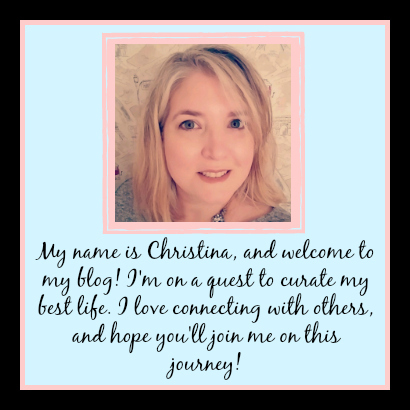 Should we all tell our stories if it might help someone, or keep some ill from happening again?? And how important is it to deal with people who share the same beliefs that you do? Can you separate someone from their ideals?? It is still National Library Week, so don't forget to share your support! !